New York based fashion designer Sabrina Zeng has launched Gemini Handbag Collection, an eco collection of handmade sleek bags that combine salvaged, luxury designer fabric with premium-quality leather. The unique, multifunctional line of handbags flaunts two seemingly different styles. While the Gemini iPad Day-to-Night Clutch is dedicated to a woman’s busy lifestyle, the Gemini Camera City Tote allows fashion-forward females to carry their DSLR cameras with them on the go. The Gemini iPad Day-to-Night Clutch comes fully lined with sultry suede to protect the tablet and features built-in credit card slots, you don’t need wallets anymore. Further available in four limited-edition designs, the clutch draws on the designer’s mixed cultural background and feature a fresh degree of luxe: premium cowl leather, refined silk embroidery, ombre lace, abstract prints with flocking texture and laminated metallic wool. Available in an array of colors, Clutches retail for $160. 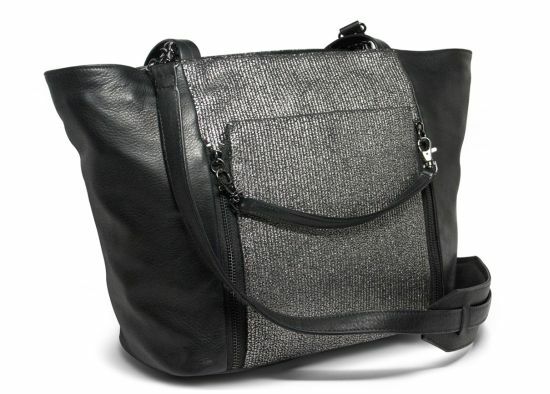 The Gemini Camera City Tote is specially designed for today’s creative woman. Just to ensure that users may access the camera quickly when needed, the tote has both top and front openings. Moreover, it flaunts water-resistant cotton lining and high-density, closed-cell foam padding providing cameras with ultimate protection. The limited edition DSLR Camera Tote retails for $375.